This web site is intended to improve connections and communication between members of the Swarthmore College Class of 1977. Although set up in March 2007 in connection with the 30th class reunion, it is hoped that this page will continue as a resource beyond the reunion, and that it will also serve to connect class members who cannot attend the reunion in person. To start with, we have an indexed collection of class notes and class member profiles from the Swarthmore Alumni Bulletin and an online edition of our freshman year Cygnet. More material will be added as inspiration demands and time permits. Suggestions are welcome! Parts of this site are password-protected. To get access, just email me for the password. Our 30th reunion was held June 8–10, 2007. Reunion information is now archived on its own page. On this page, we have News, Class Notes, Cygnet photos, demographic information (where we live and our occupations), Links to classmates, and some historical documents. Swarthmore College provides an Alumni page and a Class of 1977 page. The College also administers a class discussion list. You can send an email to all subscribing class members by addressing it to class77@alumni-office.swarthmore.edu To subscribe to the list, send a request to the list administrator. 06 AUGUST 2007: Started adding material from the college catalogues, to document the college philosophy, programs, faculty and facilities during our stay. 21 JULY 2007: Photos (portraits) from the 1976–1977 Halcyon have been added. They can be accessed, in much the same way as Cygnet photos, from the Index (which requires login). To look up a particular individual, you might like to try the Index (an HTML table) to Swarthmore Bulletin Articles. If you just want to browse through history, click on the date of the desired article in the list below. 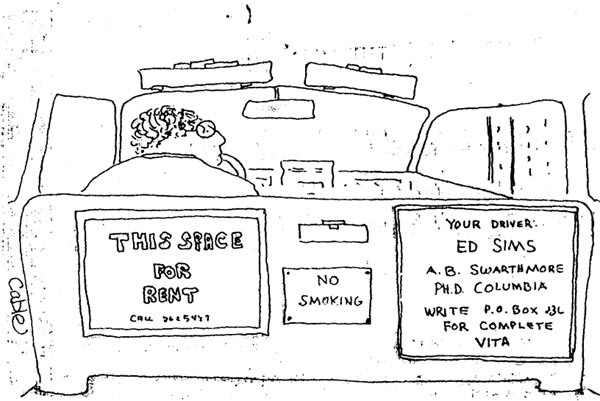 There are online Swarthmore Bulletin archives, dating from 1996, but those archives do not include class notes. Another 34 classmates are listed as “Lost”, meaning that the Alumni Office has been unable to track them down (though they could be perfectly healthy and happy nevertheless). Susan Abrecht, Stacy Block, Robert Breger, James Dill, Jeffrey Francis, Katherine Holmes, Michael Hutter, Jon Kaplan, Fred Kardonski, Madeleine Kearns, Mara Kreslins, David LaCour, Clotilde I. Nevares, John Opar, Ziya Ozkahyaoglu, Paul Peterson, Alan Petrine, Arthur Phillpotts, Stanley Reybitz, Bracken Rourke, Roger Sample, Deborah Schiffman, Judith Shriar, Joseph Spirito, Eve Stonehill, Matthew Weinstein, David White, Stuart White, Sean Wood, and Steven Woodward. Some “lost” alums turned up at the reunion, including Eric Gaal and Will Jump. If you have news of anybody else in the above list, drop me a line! Clicking on one of the links below will begin downloading a gallery of pictures scanned from the 1977 Cygnet. These are JPG pictures, about 50K each, which adds up to nearly 18 MB for the entire class. If you have a slow connection, it might help to set your browser to not automatically download images. The images have a text string description (the person's name) which is displayed when the image is not, and you can read that description before you decide whether you want to manually download the image by clicking on it. Note also that you can access one individual's picture by clicking the name in the Index to the Alumni Notes (above). The Index is not a large document, although displaying it might make your browser work a little. Due to size limitations, the picture gallery has been divided up into sections, organized alphabetically by last name. Click below to go to a section. Here are some facts about the Class of 1977, gleaned from the online Swarthmore Alumni directory. The Directory has entries for 350 members of the class. Of course, many entries are outdated or incorrect, but an effort has been made to keep them accurate. Science: Engineer (12), Physicist (5), Geophysicist, Anthropologist (1), Environmental Scientist, Scientist (2), Researcher (4), Chemist, Biological Scientist (4), Horticulture (3). Writing / Books: Writer (8), Editor (8), Journalist, Librarian (4), Bookseller. Here is a list of where Class of 1977 alumni live, by state or country (of the 350 listings for our class, 324 have a state or country of residence). The list is in order of how many alumni live there. New York (53), California (45), Pennsylvania (31), Massachusetts (26), Maryland (20), New Jersey (18), Colorado (15), Virginia (10), Connecticut (9), New Hampshire (8), Texas (8), Illinois (7), Vermont (7), North Carolina (6), Florida (5), Ohio (5), Michigan (5), Washington (5), Arizona (3), District of Columbia (3), Minnesota (3), Kansas (2), Louisiana (2), Rhode Island (2), Wisconsin (2). Plus one each in the following states: Delaware, Georgia, Hawaii, Indiana, Iowa, Kentucky, Mississippi, Missouri, New Mexico, Oregon, South Carolina, Tennessee, Utah, Wyoming. Foreign locales: England:	3 (Cambridge, Kent and Leicester); Germany:	2 (Tuebingen and Gauting); and one each in Quebec, Nicaragua, Panama (Colon), Japan (Yokohama), and Sweden (Gothenburg). Given here are links to class member web sites or other information. I'll be glad to post (or remove) these links by request. 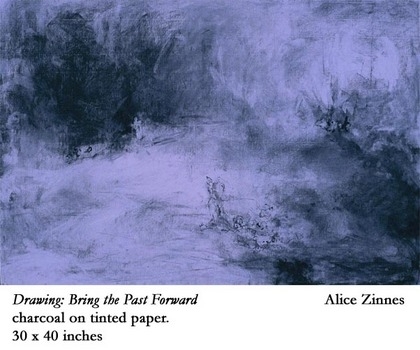 Alice Zinnes has an online portfolio for her paintings and other artworks (see example at right). Here are some things from the past that might be of interest. Suggestions and submissions for this section are welcome! Here is information about the College from the 1975–1976 Catalogue. More stuff will be added as time permits. Is there an era turning? Yes, I'd like to think so too. It's just an inevitable phase. Remember the “pseudo-subversive alternative” freshman orientation handbook? A based but very practical guide to all aspects of the College and the surrounbding community, it might bring back some memories of the way things were in 1973. Click to get a PDF of the page images (you really can't do it justice with OCR). Twenty pages, PDF size = 3.4 MP, but optimized for fast web viewing. 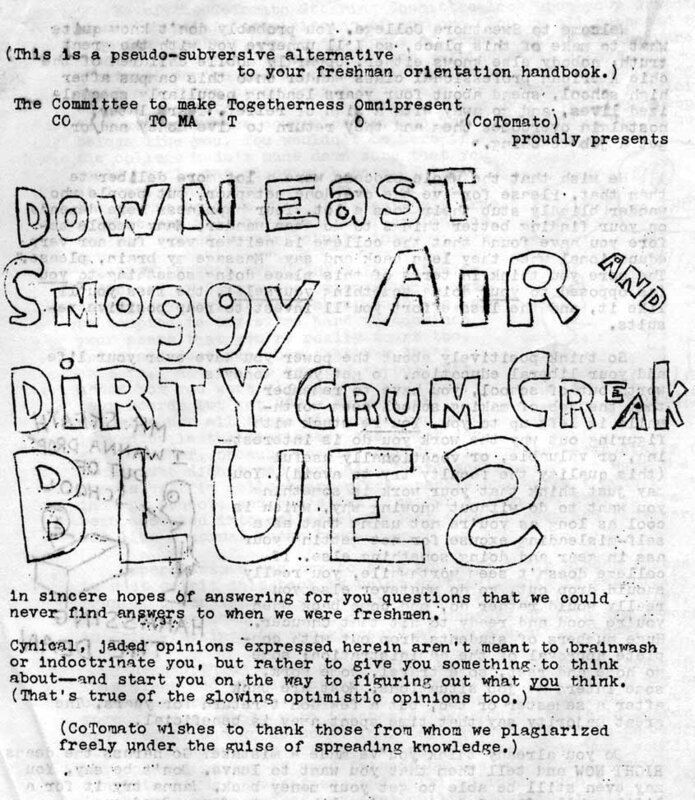 This and associated pages were compiled and written by Peter E. Pulsifer '77 for the use and enjoyment of other members of the Class of '77. There is no official connection between Swarthmore College and either Peter Pulsifer or the materials on these pages, and I take sole responsibility for these materials. Comments, suggestions, and volunteered help are most welcome. I have all kinds of ideas on improvements, but limited time and energy. Date of last modification: September 28, 2015.